Tell Tales are on the Genoa. 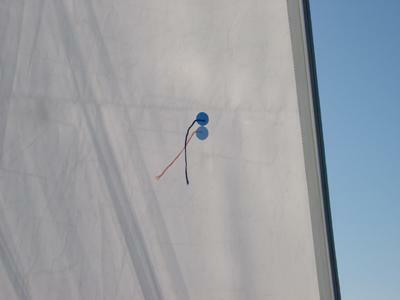 Ever wondered what those bits of string or plastic are on the genoa or jib? These little indicators are the most important thing for both the crew and the helm to be watching at all times. They are made up of a windward tail and a leeward tail. The genoa is usually see through so you should be able to see both at the same time. The crew must constantly watch them when reaching or when there is no spinnaker up. The helm must constantly watch them when beating. So do these mysterious bits of string do? When on a reach they tell the crew that the sail is either not optimised correctly or optimised perfectly. When on a beat they tell the helm that he is either pointing too high, too low, if he has a lift or if a he has a header. This may all mean meaningless to you now, but it soon won't. In the first picture, the genoa is optimised for sailing in this direction. This is because both the windward one and the leeward one are parallel pointing to the opposite direction of the boat. In the second picture, the genoa is not optimised for sailing in this direction. This is because both he windward one and the leeward one are backed pointing in the same direction as the boat. When the genoa is not optimised, the responsibility of optimising depends on what point of sail you are on. If you are beating then it is the helm's responsibility. If the boat is travelling on anything, but a beat (close haul, reach or run), then it is the crew's responsibility to play the jib. Playing the jib involves optimising the jib whilst keeping the boat going in a straight direction. Unlike when beating where the helm moved the boat to optimise the genoa, the crew must move the genoa to optimise it and the boat can continue in the same direction. 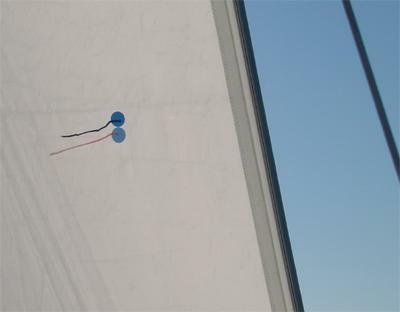 Again the same actions must be followed above, but instead of moving the tiller, you must sheet in when the windward tail is flapping and sheet out when the leeward tail is flapping. Tell tales are incredibly useful for helping you optimise our sail correctly. When on a beat they are also very useful in telling you when you have a lift, which means you can have a better course to get to a windward mark, or have header, which is where you must turn off the wind. Getting a header and not reacting quickly enough can make you tack, which could make you capsize if you don't react quickly enough. Note: Be careful with large lifts, because they are usually followed by large headers. Never be tempted to go too far into a lift that seems to good to be true. Also beware of sailing too close to the wind. This drives your speed right down and will make your performance fall (I always do this and just have to keep practicing till I don't). Even though you want to be moving as far windward as you can you also want to keep the speed on. So make sure you don't go too far into the lifts, but also make sure you take very single one, even the minor ones. When beating it is a good idea for the helm to keep the tell tales slightly backed, so that when you get hit by a gust you instantly are fully optimised. When gusts hit you are instantly over powered, which will make you go much faster than other boats that instead are pushed leeward. Also, whilst beating, use lifts to try and get the boat flat. If there is a lift turn into it, which will make the boat heel less. Combine this with letting out and pulling in the mainsheet and you will really work the boat.